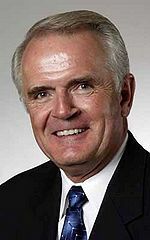 James Arthur "Jim" Gibbons (born December 16, 1944) is the former governor of Nevada. A Republican, he is a former member of the United States House of Representatives, having served from 1997 to 2006. Born in Sparks, Nevada, Gibbons interrupted his studies at the University of Nevada, Reno during the Vietnam War to serve in the United States Air Force (1967-1971). He also attended Southwestern University School of Law, in Los Angeles, and the University of Southern California for post-graduate studies. A graduate of the US Air Force Air Command and Staff College and the Air War College, he joined the Nevada Air National Guard in 1975 and served as its vice commander from 1990 to 1996. Gibbons served in the Nevada State Assembly from 1989 to 1993, during which time he was called to active service in the Gulf War as an RF-4C Flight Leader. During the conflict, he was awarded the Distinguished Flying Cross for extraordinary achievement while participating in a mission in which he flew his unarmed aircraft on a vital reconnaissance mission to acquire politically sensitive imagery of enemy targets in Kuwait. Including the Distinguished Flying Cross, Gibbons has received a total of nineteen service medals throughout his military service, such as the Legion of Merit, Air Medal with Two Oak Leaf Clusters, Aerial Achievement Medal and Air Force Commendation Medal with One Oak Leaf Cluster. In civilian life, he has worked as a lawyer in private practice, an airline pilot for both Western Airlines and Delta Air Lines, a hydrologist and a geologist. Gibbons is a member of the Church of Jesus Christ of Latter-day Saints; his wife is a Presbyterian. Gibbons ran for Nevada governor in 1994. As the Republican nominee, he lost to Democrat incumbent Bob Miller, having received 156,875 votes to Miller's 200,026. He was elected to the House in 1996 for Nevada's 2nd congressional district, and served as vice chairman of the House Resources Committee, as well as on the Armed Services Committee, the Homeland Security Committee, and the Permanent Select Committee on Intelligence. His wife, Dawn Gibbons, was elected to the Nevada State Assembly in 1998. Gibbons announced in late 2004 that he would not run for a sixth term in 2006, instead opting to run for Governor of Nevada. He won the August 15 party primary handily, defeating state senator Bob Beers and Lieutenant Governor Lorraine Hunt. In the general election he faced Democratic nominee Dina Titus, who is the Minority Leader in the Nevada State Senate. Gibbons received 47.9 percent of the votes to Titus' 43.9 percent. Gibbons resigned his House seat on New Year's Eve, since Nevada's governor is sworn in on New Year's Day. This page was last modified on 21 November 2011, at 03:48.